Easy No- Chill Sugar Emoji Cookies! 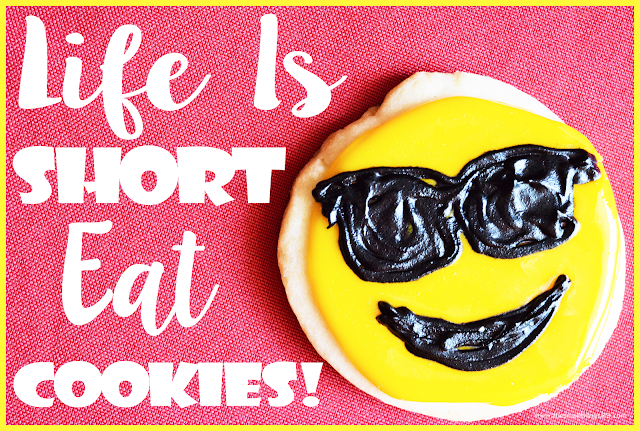 HomeEasy No- Chill Sugar Emoji Cookies! I LOVE EMOJI'S! There isn't a better way to express how you feel. I also love sugar cookies! These sugar cookies are no chill and yield about 30-36 cookies, depending on how big you cut them. Preheat oven to 400* and in a mixing bowl, beat sugar and butter until fluffy. Now beat in your egg and vanilla. Grab another mixing bowl and mix baking powder, flour and salt. Mix in with your hands (I find this to be easier) one cup of butter/sugar mixture at a time into the flour mixture until combined and dough-like. Roll into two balls and on a floured surface roll with a pin and cut with your cookie cutters. I find it easier to put flour on the cutter to get it to not stick as much. Place on a parchment paper lined baking pan 1 inch apart and bake 6-7 minutes. Let cool and then add icing. Enjoy! Combine sugar and milk until smooth, stir corn syrup and vanilla. Divide into bowls and add food coloring. To make it thick enough to pipe, add more sugar. I found this glaze dries shiny and pretty! Pipe the sides of the cookie and then add the glaze in the center to avoid spilling over. Let the cookies dry 2 hours before you pipe the tops. ENJOY! These cookies are not perfect, but they are fun and cute and they are delicious! I made this cute image below, feel free to print it. =) ENJOY this recipe! Like this post? Share with your friends or pin the first image! Thanks for reading! !